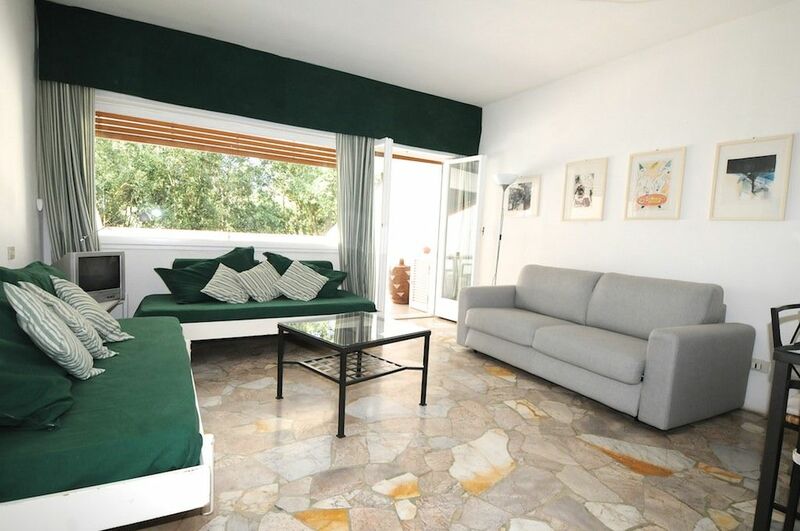 Apartment located near the Hidalgo tower in a residential complex nestled in the pine forest, 150 meters from the beach. The beach below the residence, free and not crowded (in photo) is a mixture of sand and cliffs with crystal clear water. From the house, with a short walk in the woods, you can reach the polo field, a miniature golf course, four tennis courts and a soccer field. The apartment is a spacious studio apartment with a large terrace half covered allowing you to dine outside. The cost of electricity, € 0.30 kmh, will be calculated on the basis of consumption as by reading the meter at check out. Very nice, clean and tidy, light and airy. Good location. Appartment complex was easy to find from owners direct map and final directions from the actual owners. Laura was very helpful, especially helpful was communicating via text, and in English, which made life very easy. Appartment was nice airy and light. We didn't cook but everything was there should you want to. However; no kettle!! Needs a kettle. Sofa bed was very comfy, however it would of been a nice touch if they correct sheets/ bedding were left out ready to make as it took us a while to root through the stack of bedding in the cupboards to find the right sheets. Location was ideal - nice and quiet yet a two minute walk from a lovely beach, or five to the marina. Parking not allowed within the complex, understandable as it would be very crowded, but never a problem to get parked on the road by the gate. Overall very good. We will return to Punta Ala and wouldn't hesitate to stay in that appartment again. La casa corrisponde esattamente alla descrizione ed alle foto. Abbiamo trovato Tutto ordinato e pulito, e compreso di tutto il necessario. Il contesto è molto tranquillo, nel mezzo di una favolosa pineta che da accesso alle spiagge. Presenti spiagge libere e lidi privati a pochi metri dalla casa. Noi abbiamo viaggiato per la prima volta con una bambina piccola quindi tutto è stato perfetto. Follow the signs to Punta Ala, Poggio del Barbiere, Weltring. The port, one of the best equipped in the Tyrrhenian coast, is 500 meters and is equipped with strip mall, ATM, pharmacy, newsagent and qualified restaurants, pizzeria. At the mini golf there is a nice bar where you can savor Tuscan food at reasonable prices.